Reading between the lines of this announcement, this contract has a trigger in it…so it could roll over into 2020. Secondly, the flexibility of Brown…makes Hartley that little bit more expendable from a list perspective. He would have been the perfect partner to Hawkins at the Cats should they have stuck with him. But they didn’t, so he isn’t. Ahhh, that felt good. Did well this year, the best thing about him is he can kick LONG and STRAIGHT. This is a quite an unusual trait for an Essendon forward. I forget which game it was, but it was at Etihad, and he was having a kick at goal about 45-50 out from near the boundary towards the LaTrobe St end. One of those quiet moments where you don’t expect anything to happen. Expecting a nothing kick that goes for a behind. He friggin well kicked it !!! Beautiful straight kick. It’s not what Essendon forwards do in those moments. But he nailed it. He can be a beautiful kick. found it - against Fremantle. That is a seriously nice kick. This guys wins the “Quiet Achiever” award. To sit in the trophy cabinet with his “Worst Moustache” trophy. Oh but he was a top up player in early 2015 in the JLT series and Hartley got a lot of publicity trying out to be a top up at the same time (but didn’t pass the medical) . This helped both of them get drafted by us at the end of 2015. Walla also got his first senior match as a top up at this time and was rookie drafted when they got senior drafted. 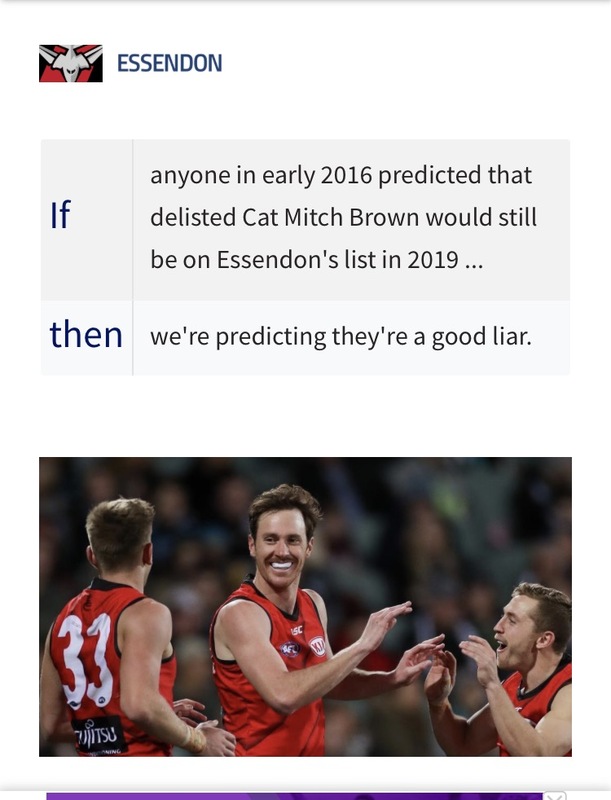 NB: Also beaten here by @The_New_Coleman and not sure if @True_Value_Blitzer was taking the ■■■■ or just not thinking of the 2015 JLT top ups as the full blown whole season 2016 AFL top ups. It is true that the media were constantly calling Brown, Hartley and Walla top ups all season, when they were well and truly on our regular list. Seen Sam Draper this year?? The guy can kick a straight ball at the goals. Excellent depth. Crazy good tall depth up forward. He is also tall back depth, Hartley may be up against it. NB: @Clark_Griswold is ahead of me on this thought. Brown has him beaten, as disgustingly repellent as Draper’s is. you wont see joe smack brown in the same team…raxx walla stringer plus bag or a resting mid just doesnt allow…its all about pressure which is something smack and joe arent overly great at! I think he only got one year because that’s the limit for top-ups. Great work from all involved. Good to see him rewarded for his efforts and l look forward to him contributing even more in the future, as l reckon he is yet to hit his ceiling. He is also building. THEN: I’ve never seen it.